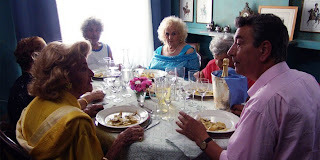 A sort of Big Night (1996) for homebodies longing for a memorable midday meal, Pranzo di ferragosto won best film at the 2008 Venice Film Festival and other festival awards. If I told you the film features four lovely Italian ladies, you are going to start thinking (1) Monica Bellucci; (2)… If I told you that the actresses – who all appear to be first-timers in film – are at least over 80 years old, your interest might waver. But don’t succumb to ageism, for this film is, among many other things, an ode to youth, or at least remaining young at heart. Gianni Di Gregorio’s film has another inspired casting choice: the director as the lead actor, playing Gianni, a fifty-something soft-alcoholic bachelor who takes good care of his mother, played by Valeria De Francisis, who either has a steel-reinforced blond permanent, or goes to bed in her platinum wig. Guffaws would be out of place in this comedy, but there is plenty of material for wry chuckles. Take the storyline of this 76 minute film – Gianni and Mamma live in a pleasant old apartment block in downtown Rome, but have fallen behind – way behind – in their condo fees; they have had their keys to the elevator taken from them. “Who needs an elevator, anyway?” rationalizes Gianni to the understanding building manager, who has a plan to help the dutiful son and his mother. It involves ‘Mamma sitting’ for his octogenarian mother for the weekend of Assumption. And that’s just the beginning of Gianni’s special weekend. Note for readers unfamiliar with European observance (especially in the nominally Catholic countries) of Assumption Day, which always falls on 15 August: in a month already known for its city-emptying tradition of mass exodus to the beach, those left behind on 15 August have to fend for themselves. Especially true when you have to prepare an impromptu feast for four (yes, the octogenarian count has risen) hungry ladies. Di Gregario has, in a light-hearted but not silly or condescending way, combined in this short gem two bases of Italian society: the filial devotion of sons for their mothers (we are not told what the daughters-in-law think), and the unending quest to eat well – even when sharpers make the most of their mid-August monopoly on the wine supply. See Pranzo di ferragosto for a midsummer Italian treat whenever it comes to your cinema or DVD distributor. We saw it, appropriately enough, in provincial France on Assumption Day weekend.